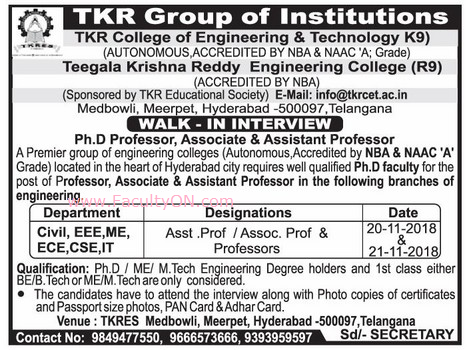 TKR College of Engineering & Technology, Hyderabad has advertised for recruitment of Teaching Faculty- Professor / Associate Professor / Assistant Professor jobs vacancies. Interested and eligible job aspirants are requested to walk-in on 20th and 21st November 2018. Check out further more details below. About College: TKR College of Engineering and Technology is an autonomous college located in Meerpet, near LB Nagar, Hyderabad, Telangana, India. The college is affiliated with Jawaharlal Nehru Technological University in Hyderabad. Ph.D / M.E / M.Tech with first class in either UG or PG. How to Apply: Interested and eligible candidates are requested to attend the Walk-in interview along with CV, originals & copies of certificates, PAN card, Aadhaar card, last salary bank statement and recent passport size photos to the walk-in address given below.